If you are not familiar with the idea of a 'hostel' or if you think only young backpackers feel welcome here, you'll be surprised at the high standard of our comfortable and cosy rooms. 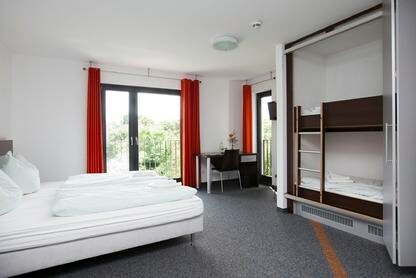 Everybody is welcome in our DJH City-Hostels Cologne, Düsseldorf, Duisburg and Bonn where we have individual offers for all of you, at unbeatable prices. 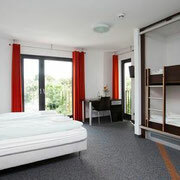 Our modern rooms to share are ideal if you travel with a school class, with a group or with your family. For more privacy accompanying persons, couples and single travellers can book our lovely single or double rooms. 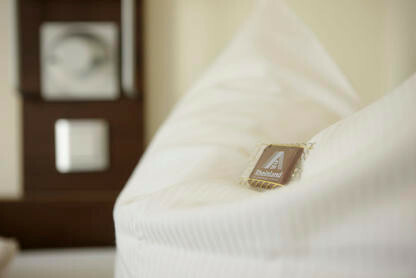 And for our handicapped guests with special needs we have barrier-free rooms, suitable for wheelchairs. All rooms are equipped with shower and toilet. 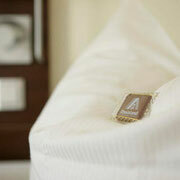 Fresh bed linen is certainly provided and awaits you in your room. There is no curfew in our DJH City-Hostels, meaning that we are open 24/7, always here and happy to answer your questions. Of course our DJH City-Hostels are still a place for encounters. In the pleasant atmosphere of our modern community areas you can meet other travellers from all over the world. You want to discover Cologne, Duisburg, Bonn and Dusseldorf? 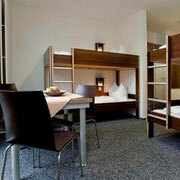 Stay in one of our DJH City-Hostels and enjoy high comfort at low prices!